Our friends at BART in the Bay Area are looking at new rail car designs to replace some of their aging fleet. The above video shows three concepts designed by BMWDesignWorksUSA — check out Concept C.
And here’s a web page on the BART website with more information about the future fleet. Below is one of the exterior designs under consideration: it allows for art work to be shown. Very nice. B option is the most forward thinking in regards to accommodating Bicycles. Which in the Bay area would be a good thing. Considering the Westside subway will need new rolling stock when it opens fully, i say we get cars like this as opposed to the typical looking subway cars. The trips are getting longer and people need a good place to sit and relax and that’s why BART has put so much effort into redesigning their cars. I love BART, i wish we had it here. Needs flippable seats like Japan so it’ll face the direction of the train depending on the rider’s needs. BART is a commuter railroad, not a Metro, so I don’t think the MTA is going to spend the uber-high $$$ on BART’s pricey commuter railroad cars. BART’s passengers and goals are different than the MTA’s. Instead, look for common subway cars off the shelf, and not any expensive concept vehicles for the Westside extension. Now, as for the concepts for BART’s new cars: All the interiors look INFERIOR to the current fleet. They look CHEAP, and not at all concerned with comfort nor seating most passengers. I for one hope none of those wacky concepts survive. Metro should look into involving the public and testing different concepts for trains when it comes to procuring new railcars. This way things like planning for bikes, wheelchairs, maps would be easier. The way it is done now seems like there is no consideration into passenger comfort or information, like we just pick a bunch of off the shelf trains that don’t interoperate. Notice how we have 5 rail lines (if you count the Purple Line separately), but we have 4 different types of trains? Insane, nobody else does this. I would expect that Metro will try to have any additional rolling stock procured for the Westside extension as compatible as possible wih the existing fleet to allow mixed trains, fewer replacement parts to procure/stock etc. The new vehicles will likely be used on both the red and purple lines and all third rail vehicles will continue to be maintained at and dispatched from at the yard east of downtown. I realize these are only concepts, but one thing I went back and replayed the video to watch for was grab bars. Many of BARTS peak commuter hours trains are standing room only, and if you get stuck near the door area, there is nothing within reach to maintain balance during deceletation or acceleration. It will be interesting to see how this detail get handled in the final designs. I agree, Metro really needs to consolidate their rail fleet so they can interoperate, but at the same time, reduce maintenance costs. The reason why majority of police cars are all Crown Victorias and Dodge Chargers are because they keep maintenance costs low by bulk buying the parts they need. Imagine if police cars differed from one station to another; one having a GM, other having a Chevy, another having a Toyota, another using a Nissan; it’ll be a nightmare just to keep different parts on stock. We may have 4 different type of rail cars but but we only have 2 fleets of rail vehicles(heavy rail/subway and light rail fleets). 3 of the 4 rails cars are light rail vehicles and they are interoperable amongst the various lines. Here is a video of the new breda cars operating on blue line tracks. http://www.youtube.com/watch?v=fTivx9TRqpw. Though you are right about Metro involving the public a little bit more with regards to the rail vehicles. I prefer the steal frame seats on the light rail cars over plastic-frame on the red line because they look cleaner and the tagging is less obvious. Los Angeles Metro Rail is a new system. Being a government agency, bids must be put in separately for procuring new rail cars. Red/Purple Line cars will never be the same as the light rail lines (Expo, Gold, Blue, Green Lines) because of different technical specs. When the current fleets of light rail railcars age out they could all be replaced with a single contract and have a completely matching fleet such as San Francisco (an old system), this is not uncommon, San Diego Trolley and NYC Subway have many railcars varying in age, builder, features. Also, BART has more in common with CalTrain (NorCal), MetroLink (SoCal), and Metra (Chicago) than it does with LA Metro Rail or NYC Subway, because it is a commuter rail system that happens to use grade separated heavy rail tech. So more comfy tech and seats are necessary for the much longer average trips, compared to say, Muni Metro in San Francisco. I would actually say that BART is something right in between LA metrorail and Metrolink. It has the distance of commuter rail and widely spaced stations in those outer areas while still having more localized underground stations in urban centers like downtown SF and Oakland (although it still needs more urban stops in my opinion like WMATA has.) IT also has frequency more similar to a metro than a typical commuter rail in the US (every 15 to 20 min or shorter where lines converge vs every 30 min to an hour on most commuter rail). And these new rail cars certainly have more in common with a metro subway type car than a traditional commuter train. Having ridden BART several times I can easily say that a system like that would be excellent for LA. Actually, BART being a commuter railroad has more in common with Long Island Rail Road (LIRR) and Metro North Rail Road (MNRR) in that both of those commuter railroads use Electrical Multiple Units (EMU) using electrified 3rd Rail such as BART (or in some cases for LIRR and MNR overhead catenary and a few diesal electric like Metrolink). There is just NO COMPARISON of BART to LA Metro Rail. One very important thing to remember is that BART is NON-standard gauge making their vehicles more expensive to manufacture (and maintain), so forget about LA ever getting BART concept cars. What we will see is most likely for Westside extension are cars very similar to the current ones, which are actually among the better ones in service around the world. Good quality, but off the shelf cars will be economical and the MTA isn’t going to have the money to play around with BART non-standard gauge prototype cars. As stated, MTA riders will on the subway trains for shorter times than those commuting to Fremont, Orinda, or you name it. As also stated, is is VERY common for Metro’s around the world to have fleets with a mixture of manufactures and models. This is unavoidable as governments have the bidding process are always trying to get the most with less and if that means an order 100 cars from a different manufacturer, than they have often saved taxpayer money, such as the case of Metrolinnk awarding Rotem the contract to build the “Guardian Fleet” as Bombardier, the legacy fleet manufacturer put forward a significantly higher bid, but between Rotem’s almost too good to be true low bid and Kawasaki’s predictably most expensive bid. BART is BART, and no commuter rail road or Metro in the U.S. uses BART’s wider gauge. Now, what I really wish we had the BART has is the excellent signage on platforms that let people know what train has arrived. WE DESPERATELY NEED SUCH A SYSTEM, not an over-priced concept car for the subway. BTW, the latest Breda LRT’s operating on mostly the Gold Line are the top models filled with a lot of tech and automation, so often it is about what upgrades a transit agency orders (from better, more expensive suspensions and boogies to automation packages and head-signs or “skirts” to make trains look nicer on the street that cover the A/C on top and the ugly equipment on the bottom or various hand rail configurations) that make the biggest difference in the quality of the car not necessarily the concept. I do like BART fleet, there very much better then what we have here in Los Angeles. @SMV & Redebbm NOT HAPPENING!! 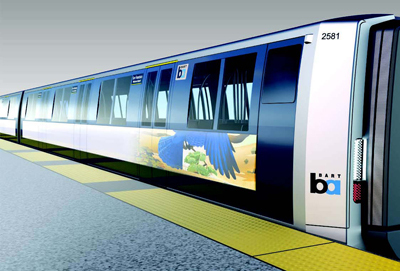 Metro is NOT getting same rail cars like BART when the westside subway extension happens. They might buy more subways cars but would be a different design probably. “Man” I Hope The MTA Would have a Better Train With TV For The Red Line and Purple Line Too so like this L,A Could have a Better Subway train than the San Francisco Bart Subway Train Or The London Tube Train.